What if? What if the economic collapse happens in the dead of winter? What if the Feds start rounding up political dissidents in February and you must escape out the back door? What if your car dies on a lonely road some night when the temperature is -20? Whatever the situation, you need to know some winter survival basics if you are going to live to fight another day. In this article I will cover some basic, common sense, winter survival tips that will keep you in the game. Obviously, the most important thing this time of year is staying warm and dry. Death from hypothermia is the biggest issue most will face in winter survival situations. The clothing you choose and how you use it can be a matter of life and death. In cold weather, wool is my favorite material for clothing. Wool is a superior insulator and it also wicks away moisture. If you have nothing else made of wool, at least invest in wool socks and a wool stocking hat. If you are sensitive to wool and can’t bear the thought of wool long johns, buy some polypropylene type long underwear that have similar properties. Always dress in layers, the more layers the warmer you will be. Dressing in layers also gives you the option to remove layers as you need to. This is the most important aspect of dressing for winter survival. As your body gets warm from traveling or working and you begin to perspire, you must remove layers of clothing to regulate your body temperature. When the strenuous activity is over, and your soaked with sweat, you face the greatest chance of hypothermia. If you are not smart enough to remove layers of clothing, you are not going to be very comfortable or last very long. Just as important as proper clothing is proper footwear. Cold, wet, feet will make your life miserable and will be a huge drain on body temperature and morale. There are two winter boots that I recommend. The first is the military surplus “bunny boots”. These are the boots I wore when tending the trapline in Alaska. They are very warm, almost too warm for the lower 48. These boots are so well insulated that you can get ice cold water in them and within minutes the water warms up to your body temperature and your feet are still warm. One time I broke through the ice and filled my bunny boot 1/4 of the way with icy water. It was -20 that day and I was quite a ways from the cabin. I was astonished when after yelling and swearing and jumping around, my foot was warm again! The only downside to bunny boots is that they are heavy. I spent a great deal of time on a snow machine in those days, so weight wasn’t a big factor. Hiking for miles with them would be tiring. The other winter boot that I really like is the Muck brand. I use the Arctic Sport variation and love them. Very warm, yet lighter than bunny boots. I use the high boot as apposed to the low top version because in the deep snow I have less of a chance of having snow getting in my boots. I have worn these on many a -20 day and my feet are always toasty. My advice is not to skimp on footwear. Spend the money and make your life bearable. The ability to start a fire is an absolute necessity. Because in the winter starting a fire quickly can be a life of death matter, you need to have multiple methods and back up methods. The most important thing is to make it easy, this is no time for exotic or primitive methods (except as backups). In the winter I have several fire making kits, one in my pack and the other on my person. In these kits I have a couple of butane lighters, matches in a waterproof container, waterproof matches, a small ferro rod, a magnesium block, char cloth, and dry tinder. 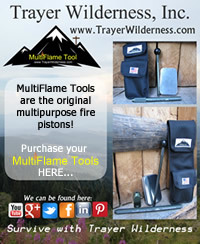 I also have Trayer Wilderness Muti-flame Tool that is a fire piston that serves multiple other functions. The dry tinder that I carry is kept in a ziplock bag and is comprised of dry pine needles, pine combs, birch bark and any other dry material I find in the woods. Most people think of hot weather situations when they think about dehydration. The truth is, extreme cold weather is just as (if not more) taxing on the human body where hydration is concerned. The good news is, in cold climate situations there is usually snow and ice at your disposal. An EmberLit campstove and a small pot is all you need to keep yourself in drinking water. You just need to remember the importance of staying hydrated and take the time to consume enough water. In the winter shelter is very important. Anything is better than nothing and most tents on the market for backpacking will keep the wind and snow off of you. If you don’t have a tent, building a lean-to shelter or digging out a snow bank will be suffice. The most important thing is keeping yourself off the ground when sleeping. This can be accomplished with layers of pine boughs. Wool blankets are a great cold weather sleeping solution but they are bulky and heavy. In my Alaskan trapping days I learned the importance of a good cold weather sleeping bag. I’ve been using a Slumberjack -20 bag for 15 years and love it. Lightweight and it keeps you warm on the coldest arctic night. 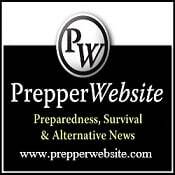 While there is much more that can be written on winter survival, this encompasses what I think are the most basic things to know. If you follow these guidelines, you will be on the right track. With right equipment and the proper skills, living outdoors in the winter can be an enjoyable experience. You need not suffer. Prepare and thrive! Great article, brother. Thank you. Used it for homeschooling.